‘Gunships - the term was first used during WWII when the weapon packages of light and medium bombers were beefed up for interdiction campaigns. The term would not be applied to helicopters until two decades later when US Army helicopters began flying the angry skies of Vietnam.’ The book’s introduction sets the tone for the rest of the prose, a historical look at an ever-shifting and varied subject. 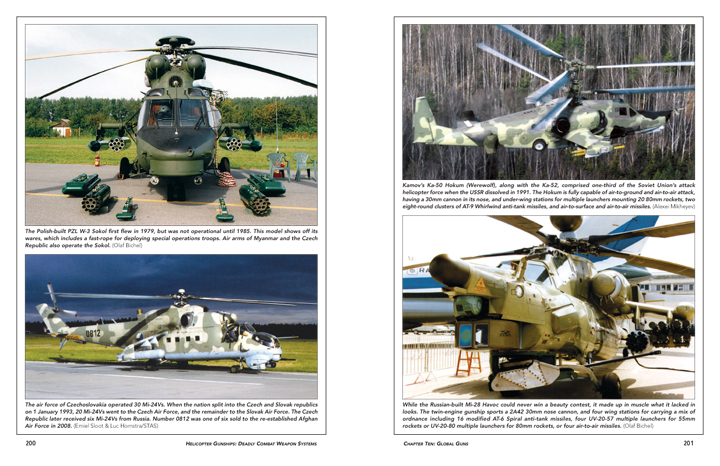 Mr. Mutza includes all armed helicopters when considering gunships, the roles are mixed between our familiar images of Cobras, Apaches, Hinds and armed transports, submarine-hunters and scouts with varied offensive and defensive roles. 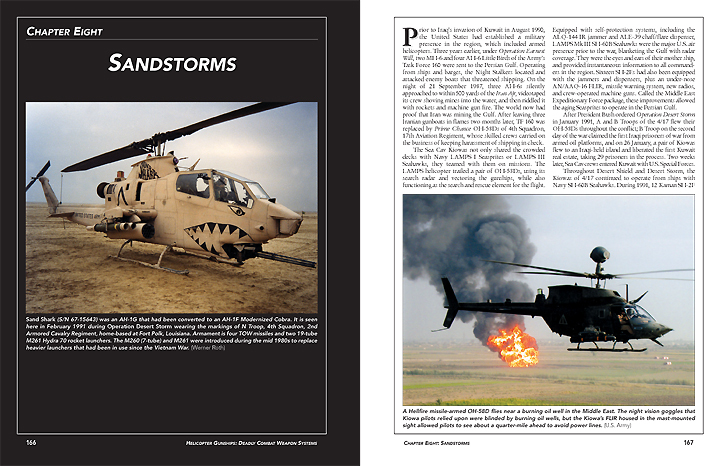 In this book, an attack helicopter is designed solely for the purpose of ordinance delivery. While the introduction of the airplane quickly drew the attention of military strategists, so did the helicopter. A stable, maneuverable and flexible platform is irresistible - that helicopter gunships exist now is no by-product of technology, but a merger. The book begins with a brief history of the earliest helicopter development in Germany and America primarily, and touching on other regions. 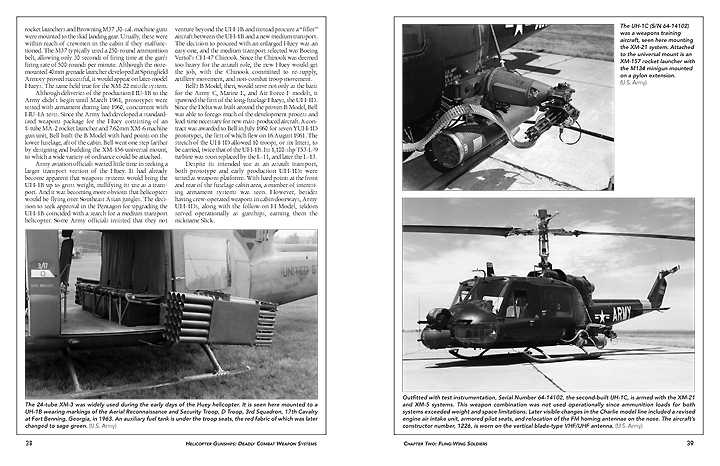 Near the end of WWII, armed helicopter experimentation began with the Sikorsky R-5 mounting a single 20mm canon. Bell’s Model 47 would prove more versatile, mounting bazookas, guns, rocket tubes and more in the care of the Marine’s Experimental Helicopter Squadron One. The French military pioneered many early armed helicopters, mostly for use in their Algerian colony. They armed Piasecki H-21s, Bell H-13s, Sikorsky H-19s and other designs, but the Sikorsky H-34 would prove most successful. From this point, a huge variety of gun systems and rockets would be mounted to a wide variety of helicopters. This told the helicopter designers one thing - a dedicated design was required. This book does a great job of showing the development of the concept of armed helicopters from what would become our familiar concept to some seemingly odd ideas. These include flying artillery batteries, which would land to load and fire before moving away again to conceptual ground-effect skimming designs to hybrid pusher systems for increased speed. Eventually Bell’s UH-1 “Huey” would revolutionize the concept. While obviously useful for transport and medivac, the troops required a gun platform which would move with them and go where they went. The US Army’s requirement for a dedicated attack helicopter would become a landmark in aircraft design. Piasecki’s Pathfinder combined their iconic contra-rotating rotors with a ducted pusher fan, it was sleek and fast but eliminated. Sikorsky’s S-61 was big, flexible, and a proven design. It would later serve Navies around the world as a great ship-based design. Bell’s Sioux Scout would turn into the Cobra, and set the stage for another competition years later which yielded the Apache. The famous but unsuccessful Lockheed Cheyenne competed against Sikorsky, Bell, and Hughes. Some time is spent showing naval anti-submarine designs like the SH-3 Sea King, the Kaman Sea Sprite, and touching on non-US designs as well. Modern designs dating back to the ‘70s are still flying in a bewildering variety around the world, and the book does a pretty good job giving an overview with plenty of pictures. Operations around the world, including our current desert operations and low-intensity conflicts have their place in this book - and you may be surprised at the modifications made to familiar designs. The book ends with a look at special operations designs, Coast Guard missions, and a chapter on non-US gunships like Russian, South African, British, French, and other designs used around the world. Gazelles, Alouettes, Hinds, Mangustas, Cobras, Mils, and many others are described and shown. What’s here for the Science Fiction modeler? Quite a bit to examine and think about. The modifications made on existing helicopters is very interesting and should give any kitbasher or designer a few things to think about. The concept of vertical flight and stable platforms won’t go away, it’s far too useful for troop support and flexiblity. Not only vehicle design, but weapons and component layout will give you a lot to learn and use. 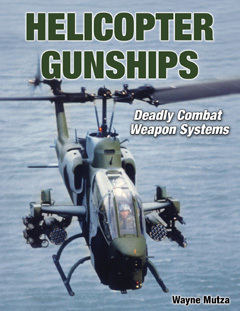 Helicopter Gunships: Deadly Combat Weapons Systems is another typical Specialty Press book. It’s exceptionally well-researched and documented and pretty nearly guaranteed to teach anyone something new about its subject. Lots of interview material is included, which is primary research with the people who designed, tested, and operated these aircraft. I highly recommend this hard-bound book. It’s 208 pages of outstanding work. Many thanks to the folks at Specialty Press for the review sample. This page copyright © 2010 Starship Modeler. First posted on 2 December 2010.